I used to really love Banana Republic—around 2003 or so, I thought the brand could do no wrong. They were always on trend, and turned out cool, often bright pieces with good prints at a decent price. But they lost their way some time ago, and I can’t recall the last time I was in one of their stores. So I was pleased to find a number of pretty good pieces on their site the other day, including this short-sleeved sweater, which is so preppy/French girl. 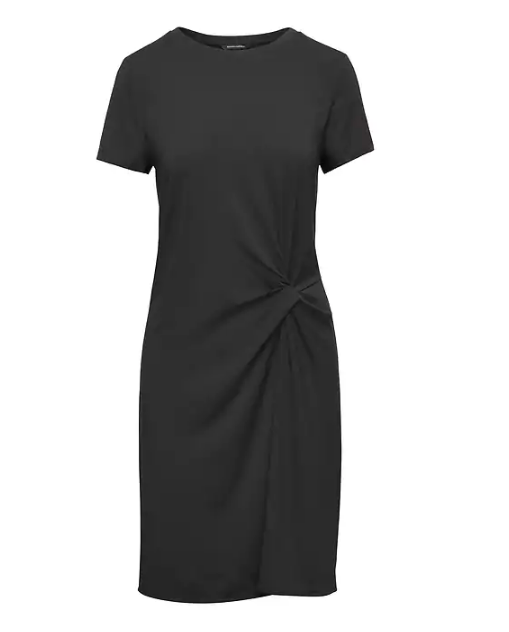 A simple t-shirt dress with a strategically placed twist keeps things flattering. 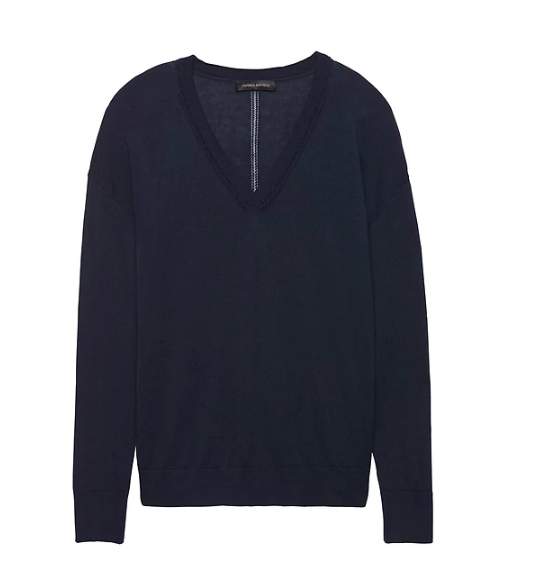 This navy V-neck sweater is made from a combination of silk and cashmere, which means it’s probably a nice, lightweight choice for spring. I like that the tie on this tank top is off to the side, which is just a bit cooler than if it were front and center. 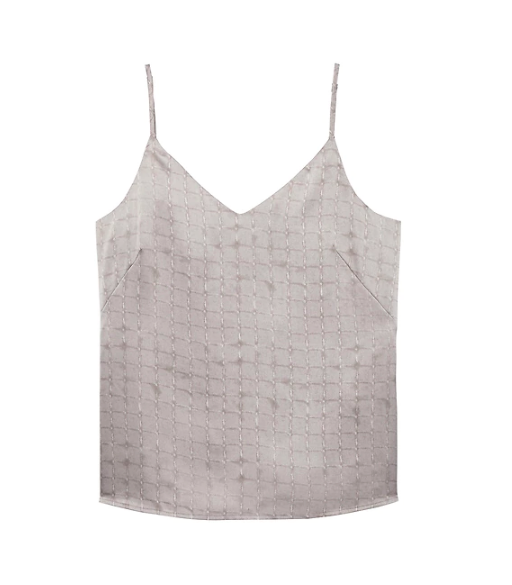 This cami has just the shadow of a print, which is kind of lovely. 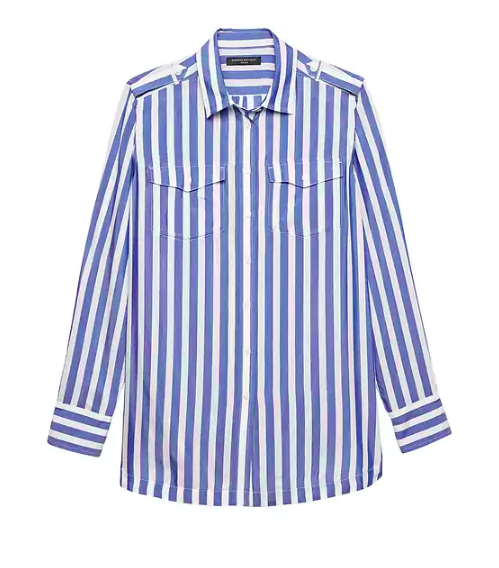 This striped shirt would look so chic with a pair of skinny black trousers. 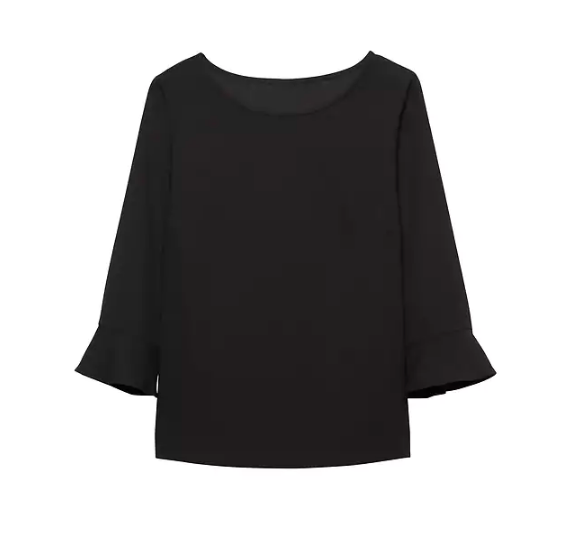 Just a simple top with slightly flared sleeves to throw on whenever. 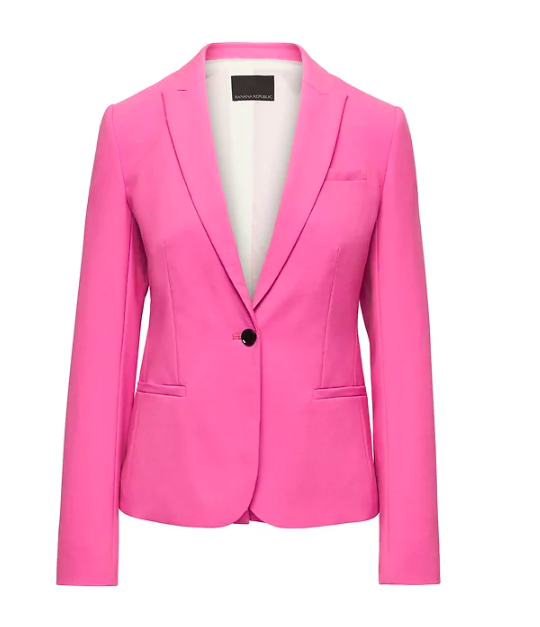 A pink blazer is a fun and unexpected choice, and would look great with graphic tees. 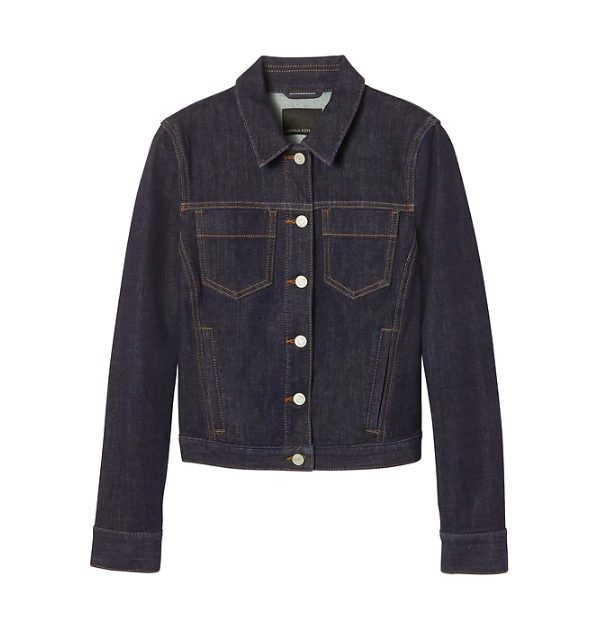 The wash on this denim jacket is so satisfyingly dark. I’d wear this shirt with white jeans and a bright belt like this one. 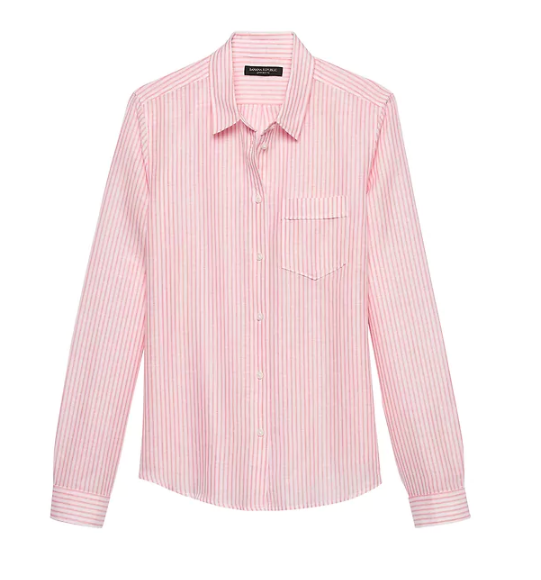 This pink-and-white striped shirt has a nice, slouchy cut. I feel entirely the same way about BR over the years, so it’s good to see some fun pieces here! Their fit was always great so the only thing missing was fun. I feel entirely the same way about BR over the years, so it's good to see some fun pieces here! Their fit was always great so the only thing missing was fun. Seeing these choices in a store I was just in a few days ago and didn’t buy anything was eye-opening. Like having a personal shopper pull stuff I never considered. Thanks so much! Guess I need to make a return visit. I like all of these. Especially the knotted dress and tank Good to know – I used to love them back when too and then they started putting out absolute nothingness. I like all of these. Especially the knotted dress and tank Good to know - I used to love them back when too and then they started putting out absolute nothingness. I also like the knotted dress. It is nice to see BR has extended its sizes a bit. Your experience mirrors mine – at one point it seems half my closet was BR, and then suddenly there was nothing of interest in their stores. I happened to take a male friend into a local BR last week (he was looking for a shirt) and as he shopped I wandered through the women’s section – before I knew it I had an armful and was headed to the dressing room. Have they had a change in management, or design team? Your experience mirrors mine - at one point it seems half my closet was BR, and then suddenly there was nothing of interest in their stores. I happened to take a male friend into a local BR last week (he was looking for a shirt) and as he shopped I wandered through the women's section - before I knew it I had an armful and was headed to the dressing room. Have they had a change in management, or design team? I have that silk cashmere V-neck and love it. I’m sorely tempted to ignore my rule of not purchasing multiples so I can have a back up. I fear I’m going to wear it until its threadbare. BR, J. 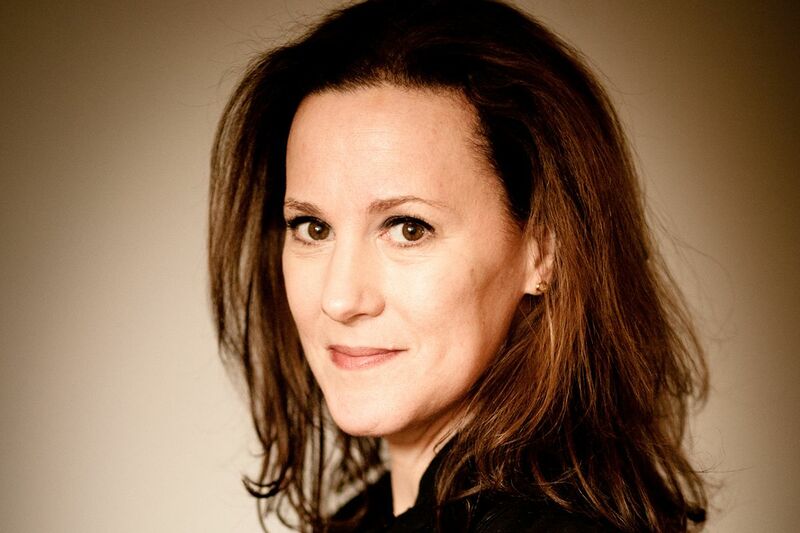 Crew, Ann Taylor – all places I used to shop a lot and now only buy from when there is a great piece like that sweater. They’ve all become too much polyester, too much off the shoulder, too many ruffles. I have that silk cashmere V-neck and love it. I'm sorely tempted to ignore my rule of not purchasing multiples so I can have a back up. I fear I'm going to wear it until its threadbare. BR, J. 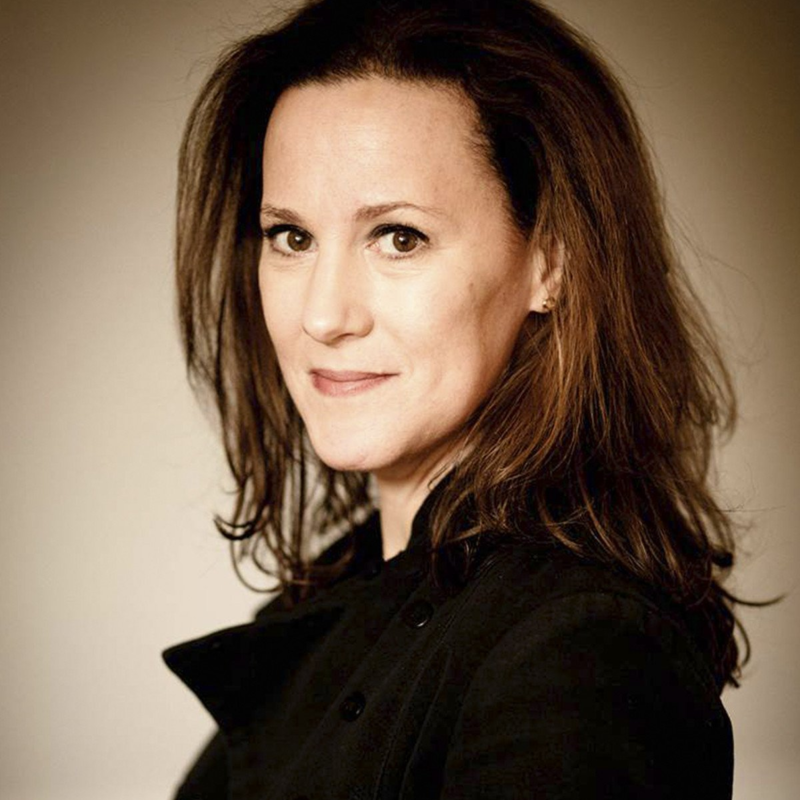 Crew, Ann Taylor - all places I used to shop a lot and now only buy from when there is a great piece like that sweater. They've all become too much polyester, too much off the shoulder, too many ruffles. Ugh, there’s really a surfeit of polyester in some of the chain stores I used to love to shop in. It’s the worst! Ugh, there's really a surfeit of polyester in some of the chain stores I used to love to shop in. It's the worst! And polyester is so damned sweat-inducing! GAH! The ruffles! I don’t shop at any of those stores anymore. Still have PTSD from the ruffle/bell sleeve/sequin explosion of 2015. GAH! The ruffles! I don't shop at any of those stores anymore. Still have PTSD from the ruffle/bell sleeve/sequin explosion of 2015.
ditto on the BR shoppabilty over the years and also on the current offerings..I have recently snagged a few really good things – at 40% off – a cashmere hoodie, double breasted 100% worsted wool blazer and a silk and cotton pullover. I was impressed – maybe they are getting back to good! 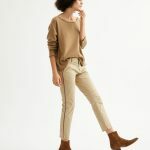 ditto on the BR shoppabilty over the years and also on the current offerings..I have recently snagged a few really good things - at 40% off - a cashmere hoodie, double breasted 100% worsted wool blazer and a silk and cotton pullover. I was impressed - maybe they are getting back to good! 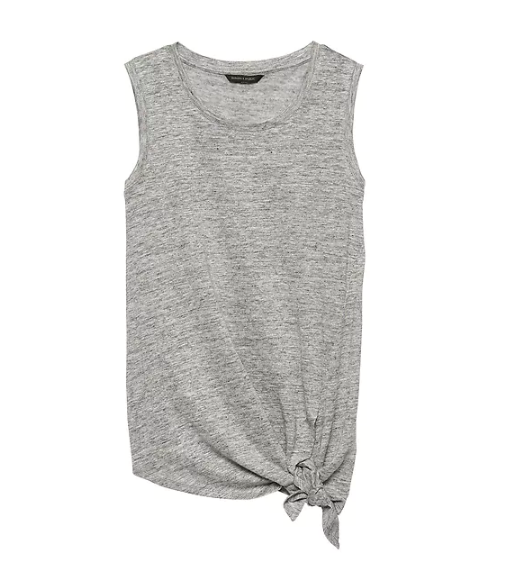 Love the silk/cashmere sweater (might do the mint color for summer w/white jeans) and the cami looks super useful because the fit doesn’t seem to be too tight. I’d sleep in it paired with a pair of loose boxers. Love the silk/cashmere sweater (might do the mint color for summer w/white jeans) and the cami looks super useful because the fit doesn't seem to be too tight. I'd sleep in it paired with a pair of loose boxers. I bought the striped sweater in black and white, and I love it. 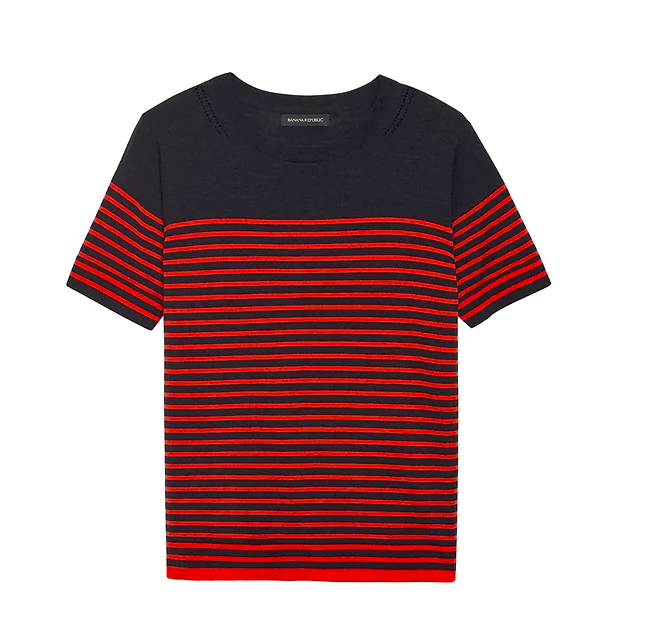 I’ve been finding a fair number of things I like at BR lately, but I missed the striped shirt, so back to the store to figure out the right size! I still heartily appreciate that BR fits us Asian ladies’ proportions, especially the shorter torso. I still heartily appreciate that BR fits us Asian ladies' proportions, especially the shorter torso. Ditto for me! My closet was filled with Banana Republic about 10 years ago, and then I just stopped. I ventured into the store last month, and I found just the most perfect date night top: a drapey v-neck striped wrapish top. And it’s like the floods gate opened–I think I’ve bought 3 other things from them? Ditto for me! My closet was filled with Banana Republic about 10 years ago, and then I just stopped. 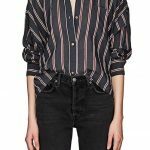 I ventured into the store last month, and I found just the most perfect date night top: a drapey v-neck striped wrapish top. And it's like the floods gate opened--I think I've bought 3 other things from them? I’ll ditto all the dittos on having the exact same experience. Seems like they took a deep dive into the bizarre cuts and weird fabrics typical of fast fashion. I did stop in this past fall and was impressed enough with their slim black wool blazer, the one with the striped lining, to buy it. And several weeks ago I went in looking for a trench coat for my niece, and found her a lovely drapey one in a dusky grey/navy that looks great on her. And wouldn’t you know, a card for 40% off hit my mailbox soon after that. so maybe I’ll spring for that sweater and utility button-down. I'll ditto all the dittos on having the exact same experience. Seems like they took a deep dive into the bizarre cuts and weird fabrics typical of fast fashion. I did stop in this past fall and was impressed enough with their slim black wool blazer, the one with the striped lining, to buy it. And several weeks ago I went in looking for a trench coat for my niece, and found her a lovely drapey one in a dusky grey/navy that looks great on her. And wouldn't you know, a card for 40% off hit my mailbox soon after that. 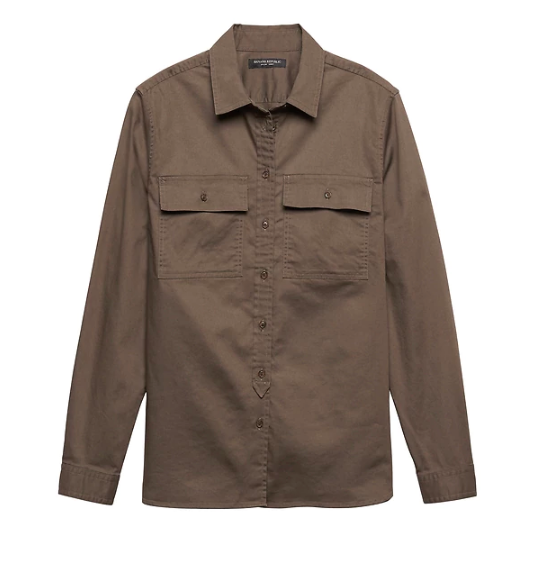 so maybe I'll spring for that sweater and utility button-down.